Rasul Douglas will be playing outside corner, and outside corner only, during this upcoming season. We are into the third week of summer auditions for the Eagles' nickel cornerback job. And while we still aren't quite sure who will be replacing Patrick Robinson at that spot in Week 1, we are fairly certain who it won't be. It won't be Rasul Douglas. 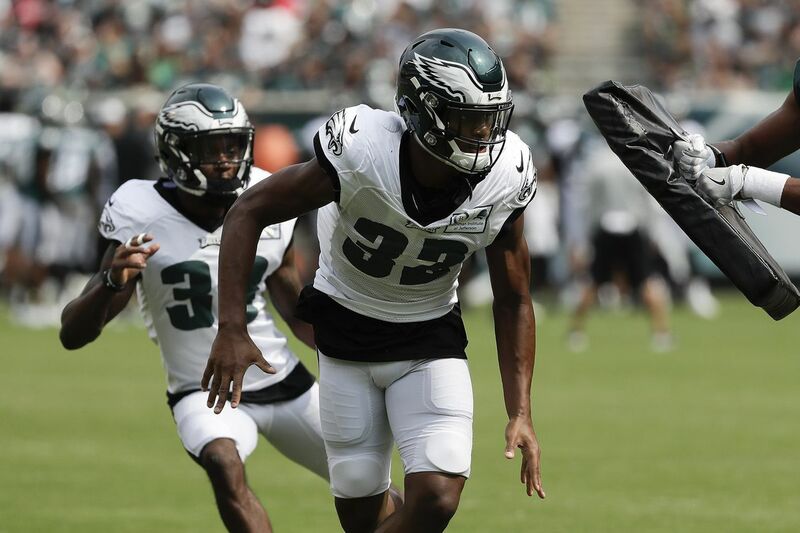 Douglas, a 2017 third-round pick who started five games as a rookie and played 41 percent of the team's defensive snaps, is one of the few corners in camp who has yet to take a single snap at nickel. Defensive coordinator Jim Schwartz values versatility. He likes safeties who can drop down and cover the slot. He likes linebackers who can play the strong side, the weak side, and the middle. And he likes corners who can play both outside and inside. But Schwartz and his defensive backs coach, Cory Undlin, both feel the best place for the 6-2, 209-pound Douglas right now is outside, and outside only. "Rasul's a tall, linear guy,'' Schwartz said. "He's got a lot of strengths. But he's not as laterally quick side-to-side as some of the other guys. The Steelers’ JuJu Smith-Schuster catches a touchdown pass over Rasul Douglas in Thursday’s preseason opener at Lincoln Financial Field. Douglas had a rough night Thursday in the Eagles' 31-14 preseason loss to the Pittsburgh Steelers. He had an interception but also gave up two touchdown passes – a 71-yarder to JuJu Smith-Schuster and a 29-yarder to undrafted rookie Damoun Patterson. "I would have liked to have seen him make both of those plays,'' Undlin said. "The first one, he was in great shape, then just kind of misjudged it. He had good position, just pulled up too soon. It was the same play that he had an interception on last year against the Giants. He just didn't play it as well. Douglas said he thought he was going to get post safety help from rookie Jeremy Reaves on Patterson's TD. But Reaves correctly followed the slot receiver on the play, leaving Douglas one-on-one with Patterson, who made a nice catch in the back of the end zone. Douglas didn't have a particularly good practice Sunday either, misjudging one throw during red-zone work and getting beat on another. It's much too soon to suggest he could be in danger of not making the team. But the Eagles do have the deepest group of cornerbacks they've had in several years. And unlike Douglas, many of the rest can play both inside and outside. That said, there aren't many other corners on the roster with Douglas' enviable length. The only other one is De'Vante Bausby, a 2017 practice-squad player who also is 6-2. Bausby, who can play inside or outside, is one of the players in the mix for the nickel job. If the season started next week, though, Sidney Jones would be the likely nickel, with Ronald Darby and Jalen Mills starting outside. "Those guys are going to keep going through there,'' Undlin said of the nickel auditions. "Sidney played in there Thursday. 'Baus' played in there. Avonte [Maddox, fourth-round rookie] played in there. I would've like to have gotten D.J. [Killings, 2017 practice-squad player] in there as well, but the way the game ended up, with us down, we didn't really get to play much nickel. But I'm going to keep rolling them. At various times last season, the Eagles kept five and six corners on their roster. It's too soon to say what they'll do this year. Douglas just needs to pick up his play and eliminate the kind of mistakes he made against the Steelers and the kind he made Sunday. If he does that, it's difficult to see the Eagles giving up on him. He played pretty well last season when he got thrown into the fire in Week 1 after Darby went down with a dislocated ankle. "The experience I got was a blessing for me,'' he said Sunday. "It really speeded up my progression. I'm a lot farther along now than I would have been if I had spent all year on the bench. I'm a lot more comfortable with everything this year. I know what I'm doing. I'm playing fast. I'm not hesitant in what I want to do. If he had done a little better job of judging Steelers quarterback Landry Jones' throw, he might have ended up with two interceptions Thursday and nobody would be talking about the plays he didn't make. Given Schwartz's fondness for players with position flexibility, it has been suggested by some that Douglas should cross-train at safety. But Undlin said that's not on the drawing board.